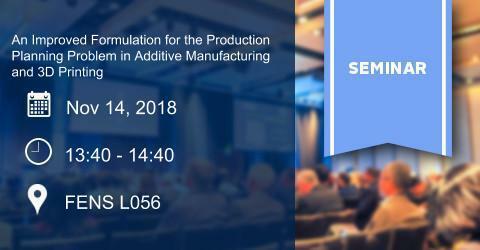 Abstract: Advances in material science as well as manufacturing technologies have given rise to the use of additive manufacturing (AM) and 3D printing in not only production of prototypes but also for production of final parts or products in industries such as aerospace, defense and automotive. This paper deals with the production planning problem in such direct digital manufacturing environments where powder-based AM machines are utilized to manufacture the parts on a job (build) basis. As the total cost of completing a job depends on the total volume and maximum height of parts assigned to that job, different combinations of parts assigned to a job yield different costs. Given the parts that need to be produced for individual customers and the available AM machines, the problem involves the assignment of parts to jobs (builds) and jobs to machines so as to minimize the average production cost per volume of material. We present a linear mixed integer programming formulation of the problem by improving some constraints provided in the first formulation of this problem. We also employ a pre-processing step to reduce the problem size for dedicated assignments of parts to jobs and/or machines. The efficiency and effectiveness of the improved model are demonstrated using problem instances from the literature. Bio: Dr. Tevhide Altekin joined Sabancı at School of Management (SOM) as an Assistant Professor of Operations Management in 2007. She received her B.S., M.S. and Ph.D. degrees in Industrial Engineering from Middle East Technical University. Her research focuses on disassembly line design, assembly line design, production planning, and design of reverse logistics networks. Currently, she is interested in designing after sales logistics networks and production planning problems in direct digital manufacturing. She has been teaching courses such as operations management, business process analysis and design, advanced Excel for managers, and introduction to management in various SOM programs such as BA in Management, MBA, Professional MBA and PhD.